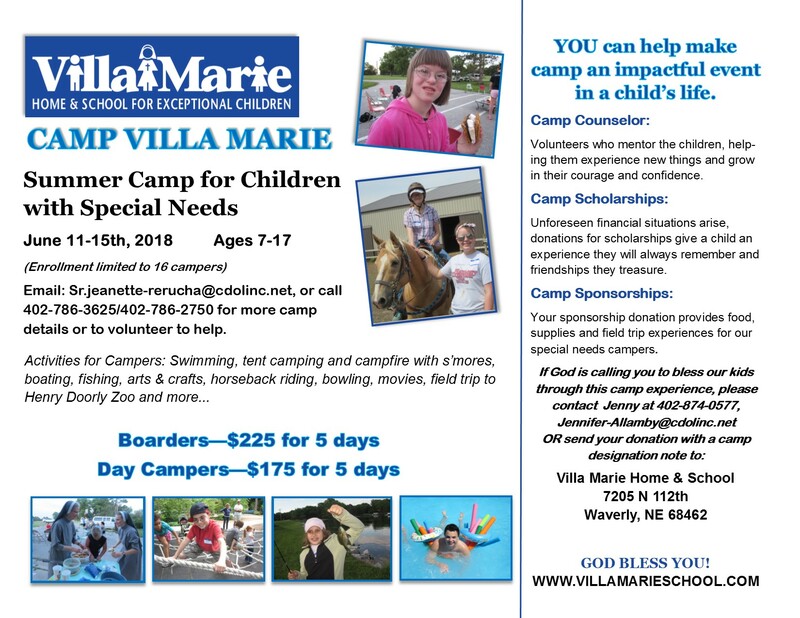 Explore the many ways to support Villa Marie and create a better future for our unique and special children. Guardian Angels are those led by God to provide tuition relief in the form of scholarship assistance to our families who are in need. These children, their families and the school desire assistance to cover the tuition gap and rely on the goodness of Angels in the community to help. The cost for Villa Marie to provide education to a day student is $7,500 and $20,000 for a boarder. Many of our families cannot afford to pay the total cost. Tuition is determined on an individual basis, taking into consideration the family’s income and other personal factors. Scholarship assistance is always necessary, as no qualifying child in need of services is ever turned away. A special endowment fund has been created for the benefit of Villa Marie through the Catholic Foundation of Southern Nebraska. Its purpose is to provide sustainable funding for Villa Marie to ensure the future of the school. We want our special needs children to always have a place in which they can get the education they need to grow in confidence of their God-given abilities. A place they feel at home and accepted by others. A place they can grow academically, socially, emotionally and spiritually. People don’t always realize the options they have for giving. That is where we come in. We have ideas and solutions that can help you to reach your financial goals while still being charitable and taking care of those you love. We work together and are connected with professionals who can assist with estate and financial planning and we can provide options that are smart and creative to help you achieve your not only your charitable goals but your overall financial goals. We can help you donate assets such as life insurance, retirement funds, land or real estate, livestock, grain, just to name a few. We can protect your wealth with a Charitable Gift Annuity, Charitable Remainder Trust, Charitable Lead Trust or a Charitable Life Estate. We can help place a strategic beneficiary on a retirement or investment account. We can help you with creation of endowment funds, donor advised and donor designated funds, bequests in your will and pass-thru gifting. Often times people find they can be charitable and benefit from doing so. Step One: Download the TAGG app. Step Three: Choose which Cause to support- Make your choice Villa Marie! The business will donate to your cause! Step Four: Share your good deed with others.